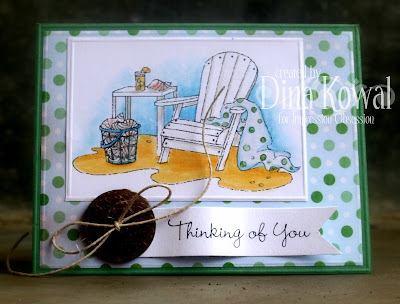 I'm really drawn to chairs, and beach scenes, so you can bet I'm a sucker for a beach chair scene! This is a sneak peek at a soon-to-be-released Leigh Hannan image from Impression Obsession. I started my design with the polka-dot paper, and mimicked the theme and colors on the beach towel. The scene is colored with Prismacolor pencils. I love the coconut shell buttons we can get here! The bookstore in town has a little craft section, so I grab up whatever is card-able whenever we go there. Lovely artwork! It looks inviting. Wow! This is gorgeous! Makes me yearn for a trip to the shore right now! No kidding, I would love to be right there! Pretty and peaceful!